Claustrophobes, take caution, and for pity's sake, don't try this at home! 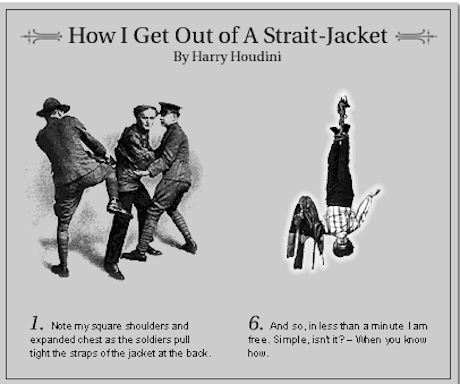 Should such warnings leave you undeterred, PBS has step-by-step instructions for performing Houdini's strait jacket escape. Well, almost step-by-step. Derived from the master's own 1909 Handcuff Secrets (read the text online here), the directions are both vague and horrifying in their specificity, falling somewhere between assembling an Ikea bookshelf and 127 Hours. For a more manageable trick, imagine yourself a face in the crowd, gazing upward at the struggling magician, without texting, tweeting, or Instagramming. Sheer open-mouthed amazement is a trick we see precious little of these days. Our best guess is that the video above was shot around 1917. “Handcuff Secrets” links to Oudini, who’s not to be confused with Houdini. See http://www.geniimagazine.com/magicpedia/Oudini. It is so cool to see how people can escape that means that we need better traps for people to not know how to escape them. You have to dislocate your shoulders, bring your arm up and over, get one arm inside the jacket, then undo at least 1 (easier with 2 on the bottom) of the straps on the top and bottom. Then you can pull it up over your head. I saw Harris III do it live at a show he did.